Meg's Boutique: OOTD- Flower Power! I got the top, shorts and jacket on a Miss Selfridge spree two summers ago and I love all of them so much! The lace detailing on the top is so pretty, the jacket is great because goes with so much and the shorts, well, I just love any shorts, particularly when they are high waisted and covered in lovely floral print! In the summer I'm always wearing my trusty over the knee socks from Primark and so today I thought, why not wear them in winter too and put them on over my tights which I think looks quite cute. I'm loving my new knitted head band and scrabble ring that I got for Christmas. The head band is great because it keeps my ears warm and I can put it on when I don't have time to do much to my hair and the scrabble ring is just too sweet and quirky! 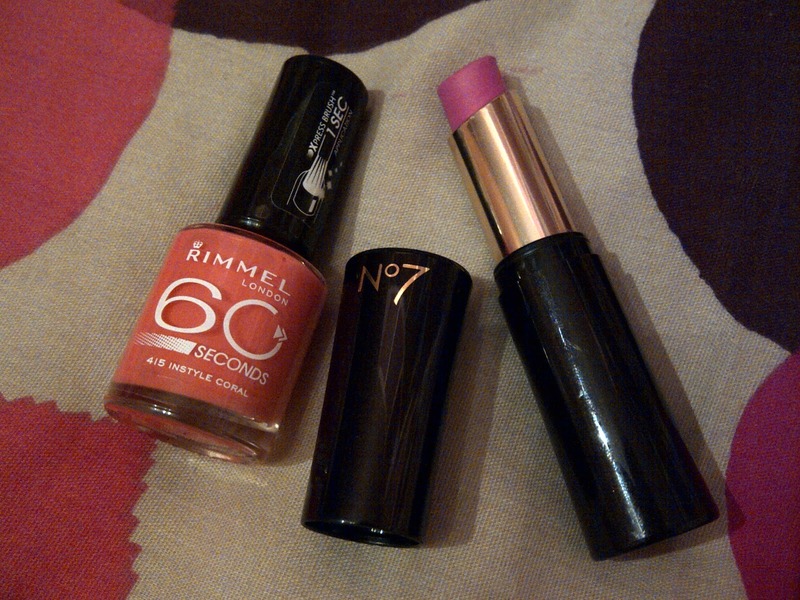 I also decided to brighten up my nails with one of my favourite ever polishes- Rimmel's 60 seconds in 'instyle coral' and to brighten up my lips I used my new No7 stay perfect lipstick in 'Mischief' (swatches and review to follow soon!). What do you think of my look? Are you getting bored of having to dress for winter yet? I hope your all having a more exciting evening! The headband is so cute, love it! Your faux fur jacket is awesome!! Love the outfit! The fur jacket is beautiful & the ring is awesome! Aww I love mother-daughter days! Loving the scrabble ring - statement rings can just make the whole outfit! Wowwww i love ur blog and the coat! Check mine and follow me if u like it! !